This is a snapshot taken at a house party at Nork House in 1907, I believe. 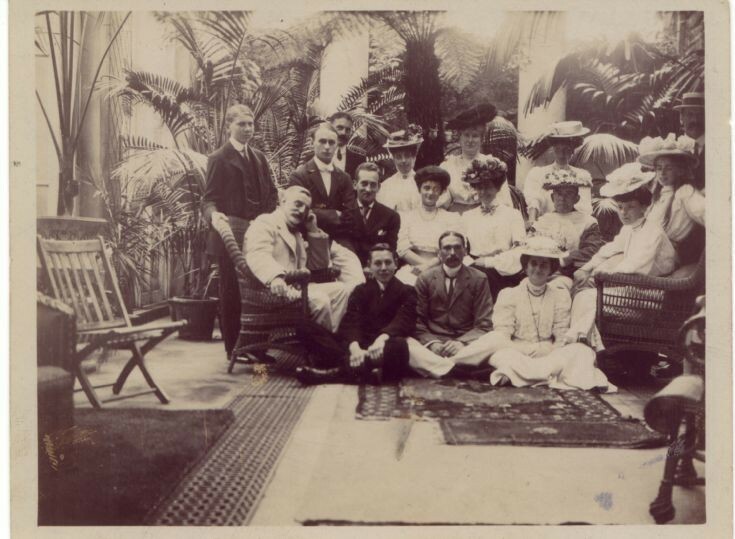 The woman in the middle, sitting, with no hat is Constance Dalziel, daughter of Murray Dalziel. The woman to her left is Helen Dalziel Colman, her aunt. Gordon Colman is sitting on the floor, in the middle. I do no know the others in the picture. "Nigel (Colman) took the group" according to the note on the back of the picture. The note indicates that a man sitting in the same row as Constance Dalziel is wearing her coat and hat. Murray Dalziel was Helen Colman's brother.